Check here for notes from previous BPIT meetings. It’s a great way to get up to speed for the next time the BPIT meets. June 7th, 2011: June BPIT Meeting: Conceptual Designs for Figueroa, Main, Spring, and More! Plus BPIT Project Updates that were presented. October 4th, 2011: BPIT Notes: 10/4/11 Westside, Environmental Review, Education, and more! January 10th, 2012: BPIT Notes: 01/10/2012 Parking, Engineering, Enforcement, and more! This is an ongoing list for agendas released before each BPIT meeting. They are typically released to the public, at the latest, on the Wednesday the week before the next BPIT meeting. Each “meeting notice” is the LADOT Bike Blog post giving notice of the upcoming BPIT meeting. Serve as a trouble-shooting body for issues getting in the way of specific projects. Improve interdepartmental communication and public participation in implementing the bike plan. Adding focus, accountability, oversight, and public input to the priority list in the bike plan is a key step towards better, open government. When/Where does the BPIT meet? The Bike Plan Implementation Team will now meet on a quarterly basis. New meeting times will be announced in the near future. BPIT meetings are held in Caltrans District 7 Headquarters, California Bear Credit Union Community Room (first floor adjacent to Broad Plaza). These meetings are 100% open to the public. The BPIT is meant to function more as an open meeting than an appointed board. The Department of City Planning is the lead agency for the BPIT with cooperation from LADOT, but the rest of the BPIT will be entirely determined by who shows up. If you choose to go, expect to see bicycle advocates, members of the Bicycle Advisory Committee, a few council office representatives, and maybe a representative from the Mayor’s office. Representatives from Metro, the County, or other agencies may be invited when issues that involve them are on the meeting’s agenda. How does the BPIT work? During meetings, issues will be identified, solutions will be created through a collaborative process, and various roles and goals will be assigned to City staff and members of the public according to their abilities. BPIT meetings will serve as a “testing ground” for projects in their early planning stages and help nudge them along the path to completion. The input of the public will be essential to which projects move forward first. BPIT meetings are planned to last about 180 minutes, and the agenda for the next meeting will be determined at the end of each BPIT meeting. The BPIT isn’t meant, however, to simply oversee the construction of infrastructure. 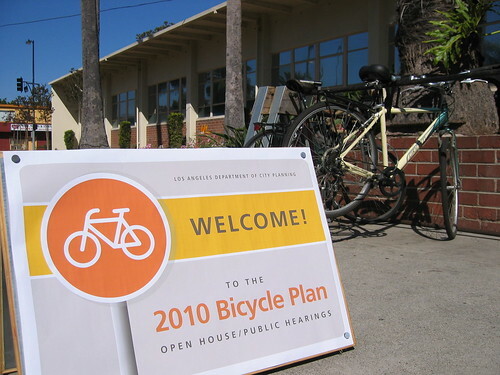 All the policies and programs contained in the bike plan are fair game for the BPIT’s attention, including focus on outreach, education, encouragement, and evaluation. Those members of the public who show up to the BPIT will be able to make sure the policies and programs most dear to them are the first to move forward. I filled out the application for bike rakes at two location in front of our apartment buildings for the county. I’d like to know how do i check on the progress of putting in the bike rakes?